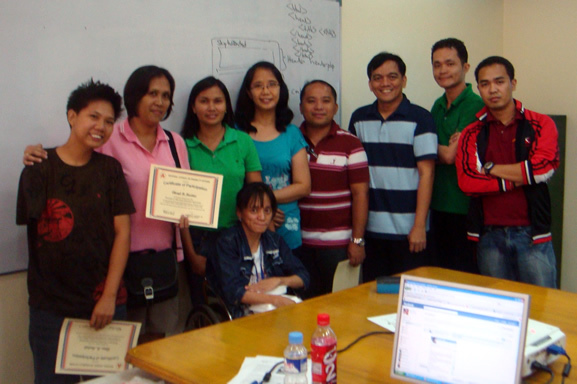 MCCID Training Director Jojo Esposa Jr. conducted a free three-day workshop on web accessibility and WordPress Content Management Systems (CMS) from June 23 – 25 sponsored by the National Council on Disability Affairs (NCDA). The seminar/workshop was held at the NCDA Board Room. It aims to expose the government partner agencies as well as local government units about making their website accessible to everyone especially those with physical impairments. Technology. He also tackled on the popularity of online social networking and how it changed the lives of Filipinos. In the afternoon, he focused on access barriers of persons with disabilities and how web accessibility can help them remove those challenges. On day two, he introduced the Philippine Web Design Accessibility Recommendations as well as the Manila ICT Design Recommendations. He also made a demonstration on how to validate web sites online as well as manually. On the third day, he introduced Content Management System using WordPress. The attendees were able to install web servers and WordPress CMS on their demo-computers and created their first simple website. Ten government agency representatives working under their Management Information Systems/Information Technology departments were initially selected to participate in the workshop. Three of the attendees came all the way from Misamis Oriental and Iloilo. In his welcome speech, NCDA Executive Director-OIC Mateo Lee expressed his full support in promoting web accessibility as well as encouraging other stakeholders to be more concerned with visitors of their official website with which some of them might have difficulty accessing. He also promised future follow up seminars for others who were not able to attend. Certificates were awarded to all the successful attendees.